The condition of girls and women-–their nutrition, health and social status–is one of the indirect cause of under-nutrition in India, said Purnima Menon, 46, a senior research fellow at the International Food Policy Research Institute (IFPRI), a think tank. Various forms of malnutrition contribute to almost 45% deaths of Indian children under five, she told IndiaSpend,in the course of an interview that assessed the Integrated Child Development Scheme (ICDS), India’s 40-year old nutritional scheme, the importance of health data and institutional measures to fight malnutrition. Menon is based at IFPRI’s Asia office in New Delhi and conducts applied nutrition research with a focus on programmes and policies to improve maternal and child nutrition in South Asia. She currently leads a team conducting impact and process evaluations of ‘Alive and Thrive’, an initiative to improve infant and child nutrition in Bangladesh, Vietnam and Ethiopia. She also co-directs POSHAN (Partnerships and Opportunities to Strengthen and Harmonize Actions forNutrition in India), a four-year initiative to build evidence, partnerships and communications to improve nutritionpolicy and program actions for nutrition in India. Menon’s foray in nutrition research was not planned: She loved food and opted for a bachelor’s degree in nutrition, so she could open a restaurant or work in the hotel industry. Later, with a masters in nutrition, she worked on an advocacy project with Nutrition Foundation of India. After working with Lawrence Hadad (a renowned economist who worked on the intersection of poverty, malnutrition and food insecurity; Haddad is a senior IFPRI research fellow and a co-chair of the Global Nutrition Report’s independent expert group) and others, Menon chose a career that explored research, data and evidence for public policy. We know that poor nutrition and severe infections are some of the direct causes of malnutrition. What are the indirect factors that impact undernutrition? The lack of nutritious diet and infections–not just severe, but also mild but long-lasting underlying infections–are the most direct causes of malnutrition. There are some key indirect factors that contribute to these proximal causes, and it’s hard to think about solving the malnutrition challenge without addressing them. First, on both undernutrition and issues of nutrition-related, non-communicable diseases like diabetes and heart disease–birth matters. Being born small for gestational age, or pre-term, carries enormous nutritional risk for all kinds of malnutrition. A key underlying driver, therefore, is the condition of girls and women–their own nutrition and health, their social status that determines their age at marriage, their educational status, their economic empowerment and so much more. In India and in South Asia, gender discrimination is one of the most significant underlying factors for poor nutrition. Poverty that itself underlies conditions like limited ability to access nutritious food, limited time and control over time and access to sanitation are important determinants. In many ways, the nutritional status of a population–especially something like height–reflects the many facets of inequity in society. Despite having the 40-year-old Integrated Child Development Scheme (ICDS) that increased spending on child health by 200% over a decade, India continues to have 40 million children under five who are stunted, the largest in the world. How effective are direct nutrition-based programmes in reducing malnutrition indicators? Look, a major part of the issue here is the notion that ICDS can address stunting without anything else happening to address the other determinants of stunting. It simply cannot. We just really need to admit that, and find ways to close gaps in those other determinants of stunting in India. Study after study shows that the condition of girls and women, sanitation, health services and poverty matter. But the discourse and the policy response have remained focused on whether or not we are delivering food through the ICDS for such a long time. This is changing but all too slowly. Nutrition is too important to be left to the ICDS. On the ICDS itself, though the 40-year history is just part of the story, let’s remember that the programme started very small, and was only in pockets for the bulk of these forty years. It’s only in 2006 that the directives to universalise the programme were issued, and the response from states has been variable: Universalising a programme like that takes time, and then assuring quality of services also takes time. What’s neat is that in the ten-year period since 2006, there have been many approaches to improving various ICDS services across the country with varying results. ICDS is an important platform for preventive services like screening for severe malnutrition.We shouldn’t write it off. At the same time, we should be very measured in what we expect from strengthening ICDS. We can’t expect stunting reduction of the scale or pace that is needed from doing just that. Is the government reluctant to release health data? The latest National Family Health Survey-4 (2015-16) was released after 10 years. Why is it important to have periodic and good quality data? Data are always contentious and contested but (they are) so important to benchmark and track progress. I don’t think the government is reluctant to release health data from the standard health surveys–those are all available. I think the challenge/issue has been that for the last decade, India experimented with various types of surveys after the NFHS–the district level health survey (household-level survey at the district level across the nation), the Annual Health Survey (conducted by the Registrar General of India across eight high focus states of Jharkhand, Chattisgarh, Uttar Pradesh, Bihar, Madhya Pradesh, Rajasthan, Odisha and Assam) and surveys like the Rapid Survey on Children (data from which have still not been released). The new avatar of the NFHS, which is district-based and provides data on health, nutrition and several key determinants, is very encouraging. I understand that NFHS-5 will come within three years of NFHS-4. That is so good to hear because frequent data on outcomes like nutrition really matter a lot. We need to be able to track outcomes in ways that measure outcomes consistently, use sampling frames that are comparable, and also provide insights on how determinants are changing and how service coverage is changing. The focus on coverage and on determinants is absolutely central to understanding how progress is being made towards outcomes like stunting because policies cannot change stunting without changing its determinants. There is no magic wand. And this means that, even on data, we must track use of interventions and changes in determinants. While there are other primary causes of deaths of children under five–pneumonia, diarrhoea and encephalitis–what role does under-nutrition play in these deaths? 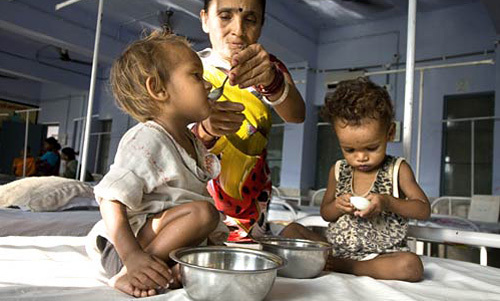 For example, the recent deaths of 52 infants in Jamshedpur were related to malnutrition. Undernutrition–both stunting and wasting–increase the risks of dying from infections very significantly. This is also recognised in the field of other infectious diseases. Globally, it’s estimated that various forms of malnutrition contribute to almost 45% deaths of children under five. That’s enormous, and that needs attention. If children are already wasted coming into an infection, that increases their risks of death. How effective are institutional factors in reducing malnutrition? For example, in Maharashtra, a committed leadership, setting up of nutrition mission and the focus on feeding practices led to a reduction of malnutrition from 39% in 2006 to 22.8% in 2012. Institutional factors, especially leadership, transparency and a focus on outcomes are always important–not just for nutrition but for so many other things. I think the Maharashtra story is important but I don’t think the storyline is as simple as you put it. If you look at the data for that time period in Maharashtra, you’ll see that many things changed over that same time period, especially women’s nutritional status, antenatal care and other services as part of the National Rural Health Mission (to ensure accessible, affordable and quality healthcare to rural areas). So, to pin down to a single storyline around the focus on feeding practices for improvements in stunting is challenging. It doesn’t acknowledge what we know about the multiple determinants that changed during that same period. The leadership and the mission were seen to have helped keep nutrition on the agenda and provide the framework and support for the much-needed improvements in services for children. Since the leadership has ebbed somewhat in recent years, you are seeing more and more news about the challenges within the ICDS in Maharashtra now. While India has reduced stunting by ten points in the latest NFHS-4, from 48% in 2005-06 to 38% in 2015-16, wasting has increased from 19.8% in 20015-06 to 21% in 2015-16. Are stunting and wasting affected by different factors? This is definitely a bit of a puzzle to unpack for us as researchers, and from a policy perspective. Honestly, I think we cannot do much to explain this until the final unit-level data from NFHS-4 are available. Firstly, the small increase in wasting may simply be a statistical artefact, and we need to look at confidence intervals in the data to know whether that is a real increase. Second, we need to look at whether some of the wasting is seen in areas where children are now taller but skinnier because of poor diet. Third, we need to know whether the stunting gains came from birth or from diet, whether stunting and wasting co-exist in the same children, or whether it is just different population of children we are talking about when we look at these averages. So, there is a tremendous amount to examine in the data around this particular issue (and others). Stunting and wasting do have somewhat different–but connected–etiologies (causes) but they are not dramatically different. We know that children who are chronically wasted are at a higher risk of stunting. Wasting can be precipitated and exacerbated by very poor diets, repeated or chronic illnesses, and this certainly needs immediate attention. The latest NFHS-4 data show that India’s infant mortality rate (IMR or deaths per 1,000 live births) of 41 still lags other poorer neighbours like Bangladesh (31) and Nepal (29) and the African countries of Rwanda (31) and Botswana (35). Despite India’s economic progress, it struggles with nutrition indicators and public health challenges. Is the assumption that better economic progress will lead to better health a flawed one. Why? Better economic progress is really important because that is what puts money both in people’s pockets and as government revenue. Without economic growth, you can’t get investments in public programmes without dependence on foreign aid. Economic progress that leads to equitable growth and investment in good policies which, in turn, leads to better health outcomes is preferred more than growth that is inequitable and not investing in public welfare or policies supporting public welfare. So, the nature of the growth and what happens with the revenues makes the difference. No one can do anything without money/income–neither the government nor individuals, right? India has missed its crucial millennium development goals (MDGs) of reducing child deaths by two-thirds and reducing maternal mortality to 109 deaths per 100,000 births by 2015. Do you think India will achieve sustainable development goals (SDGs) put forward by United Nations like ending preventable deaths of newborns to at least 12 per 1,000 live births and under-5 mortality to at least 25 per 1,000 live births? It’s hard to predict what India can and cannot achieve around the SDGs. What we can say now is that India needs to really focus and strengthen efforts. There is more of a commitment to the SDGs in India than what we had seen around the MDGs, and that’s a great sign. We are hearing about it at all levels in government, for instance. But in the end, policy is as policy does, and the talk and stated commitments only go so far. The real sign of commitment is in the actions taken, the financing to support those actions, the building of capacity to do what needs to be done, the monitoring of progress towards targets at all levels–which states will hold back progress, which districts need more attention, which policy instruments will deliver more rapid impacts and change than others–these are the real questions. At an SDG event recently, public policy expert Pratap Bhanu Mehta asked: “Yeh sab karega kaun?” (who will do all this?). I thought that was brilliant–someone has to do what is promised, and leadership has to invest in ways that make it easy for those people to deliver and do, and then must monitor and reward their performance. We can’t meet an SDG target for health with poorly paid, overworked frontline workers, for instance–we can’t afford to monitor the SDGs in plush conferences and offices when the hard work to be done to achieve those SDGs is done by people working under the most challenging of conditions.